Learn everything about white Bordeaux wine with information on the best vineyards and the top chateaux making Bordeaux Blanc, the grapes used to produce white Bordeaux wine along with the taste and character of white Bordeaux wine, plus tips to help with matching white Bordeaux wine with wine and food pairings for both dry, Bordeaux Blanc and the famous sweet, white Bordeaux wines of Sauternes and Barsac. The Bordeaux wine region is most for the production of red Bordeaux wine. That is not in question. However, Bordeaux also produces close to four million cases of white Bordeaux wine per year. In fact, close to 10% of all Bordeaux wine is white. It’s important to note, that was not always the case. Not that long ago, up until the late 1950’s, close to 50% of all the wine produced in Bordeaux was white. As you know now, that is no longer the case. What is interesting to know is that the change in the grapes planted in Bordeaux took only a few decades. The move to producing mostly red Bordeaux wine began taking place after the devastating frost of 1956. The frost, coupled with consumer demand and better knowledge of the soils and terroir led to a complete replanting for much of the Bordeaux wine region. Today, the quality of white Bordeaux wine has never been better for both sweet, Bordeaux wine and dry, white Bordeaux. Much of that credit deserves to be given to Professor Denis Dubourdieu. Denis Dubourdieu was directly responsible for many of the changes in the vineyards and the cellars that have led to explosion in quality for white Bordeaux wine, including using less new oak, during the vinification and aging process as well as harvesting dates and soil studies. White Bordeaux, also known as Bordeaux Blanc is easily divided into two parts, dry and sweet. The most famous dry white Bordeaux wines are produced in the Pessac Leognan appellation. These wines are stunning and can be compared with many of the world’s best white wines. They are age worthy wines that are filled with character. As you know from reading this website, it is the terroir that allows different grapes to be more expressive than in other appellations. In Pessac Leognan, there are cooler terroirs, due in part to the large amount of forest land, with soils that combine clay, gravel and large deposits of limestone. These specific soils allow for the production of sublime white Bordeaux wine. Sauvignon Blanc and Semillon are the most important grapes used for the regions dry, Bordeaux white wine as well as for the sweet white, Bordeaux wine. The remaining 1% is devoted to various grape varietals consisting of Colombard, Folle Blanche, Ugni Blanc and assorted grapes in field blends. Dry white Bordeaux wine from Pessac Leognan are always blends. The rules of the appellation insist that a minimum of 25% Sauvignon Blanc be included in the blend. However, for most estates that rule is not relevant as on average, close to 70% of dry white Bordeaux wine from Pessac Leognan is usually from Sauvignon Blanc. The white wines of Pessac Leognan are produced in a wide range of styles ranging from light with citrus character, to stellar expressions of terroir with complex perfumes of flowers, citrus, lemon, grapefruit, spice, minerals and honey. The best white wines from the region can age for decades. However, problems with aging white Bordeaux wine have been discovered due to the effects of premox, or premature oxidation since about 2003. White Bordeaux wine is complex and age worthy. When young, tasters enjoy pronounced sensations of flowers, citrus, vanilla, lemon, crushed rocks, grapefruit and lime. As white Bordeaux wine ages, the color deepens and the wine takes on additional characteristics of freshly cut lawn grass, honey, minerality, spice and butterscotch. Numerous producers in Pessac Leognan make white Bordeaux wine. The undisputed king that produces the best dry, white Bordeaux wine is Chateau Haut Brion Blanc. This is no secret to the wine buying world as the price makes it one of the world’s most expensive white wines. It sells for as much as $1,000 per bottle! Price aside, Haut Brion Blanc can also compete with any of the world’s best white wines. It combines an intensity of flavor with rich textures, concentration, complexity and has the ability to age for decades. Chateau La Mission Haut-Brion Blanc also makes one of the finest expressions of white Bordeaux wine. 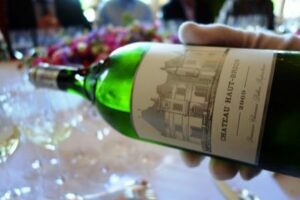 Similar to what takes place with the red wines of Haut Brion, La Mission Haut-Brion Blanc can be a bigger wine than Haut Brion, but it lacks the same delicate features. Once past Haut Brion Blanc, there are numerous choices for white Bordeaux wine from Pessac Leognan. Domaine de Chevalier, Smith Haut Lafitte, Malartic Lagraviere, La Tour Martillac, Haut Bergey and Carbonnieux are a few of the other estates in the appellation making great white Bordeaux wine. White Bordeaux wine is also produced in other appellations. A few producers in the Medoc make a dry white wine, most notably, Chateau Margaux with Pavillon Blanc. Chateau Margaux makes the best white Bordeaux wine in the Left Bank. Due to the cooler terroir, the southern most soils from the Margaux appellation produce more white Bordeaux wine than in any other area in the Medoc. Aside from Chateau Margaux, Chateau Prieure-Lichine and Chateau Palmer are the most famous estates in the appellation working with white wine grapes. In St. Julien, Chateau Talbot and Chateau Lagrange produce dry, white, Bordeaux wine. Chateau Mouton Rothschild makes Aile d’Argent and Chateau Lynch Bages make very popular white wines. Starting in 2007, Chateau Cos dEstournel joined the small group of estates in the Left Bank making dry, white Bordeaux wine. This was followed by Tronquoy Lalande a few years later. White Bordeaux wine from the Medoc is sold as a generic AOC Bordeaux Blanc. In the Right Bank, several estates also make white Bordeaux: Chateau Monbousquet and Valandraud are two of the top producers making Bordeaux Blanc. But they are not the only famous estates with that idea. Cheval-Blanc is now also making a dry, white wine from vines planted just across the road from their famous estate. Because white wine grapes are not allowed to be planted in the Medoc or St. Emilion, due to AOC law, the wines are labeled generic, AOC Bordeaux Blanc. It’s not only the prestigious appellations that make white Bordeaux wine, value priced white Bordeaux wine is produced in the Entre deux Mers appellation. More white Bordeaux wine is produced in Entre deux Mers than red wine, as well as in other Bordeaux regions, for example Premieres Cotes de Bordeaux. There are also numerous inexpensive, good value, white Bordeaux wines produced from the Graves appellation that are worth seeking out as well. They are delicious, fresh, drink well young and best of all, they are affordable. White Bordeaux wine is produced from blends featuring mostly Sauvignon Blanc and Semillon. Although a few estates can include Muscadelle, it is not common. A very, small amount of odd white wine grapes are also planted in less prestigious areas in the region for the production of dry white Bordeaux wine; Colombard, Folle Blanche and Ugni Blanc. Those grapes are probably used in the production of inexpensive, white Bordeaux table wine. There are now a few producers making white Bordeaux wine from grapes that are not allowed to be sold as Bordeaux, because the grapes are forbidden by INAO rules from both banks. These wines are sold as Vin de France. In the Left Bank, Chateau Palmer makes a white Bordeaux wine blending of 65% Muscadelle, 25% Sauvignon Gris, 5% Merlot Blanc and 5% Lauzet. Starting with the 2014 vintage, Chateau du Tertre started making a white wine from 42% Chardonnay, 31% Gros Manseng, 16% Viognier and 11% Sauvignon Blanc. Chateau du Retout in the Haut Medoc makes wine from a blend of Sauvignon Gris, Gros Manseng, Savagnin and Mondeuse Blanche. In the Right Bank, there are also a few mavericks making interesting white Bordeaux wines from blends that break INAO rules. In 2013, Clos Dubreuil became the first estate in Bordeaux to make a wine from 100% Chardonnay. Hubert de Bouard of Chateau Angelus is now producing a wine from 100% Chardonnay, you can expect others to follow in due time. There are several other producers making interesting white Bordeaux wines from grapes not allowed to be planted in Bordeaux. Chateau Vieux Taillefer produces a wine from old vines that blends Sauvignon Blanc, Semillon, Sauvignon Gris, Merlot Blanc, Chasselas and Roussette. Croix de Labrie started making Chardonnay in 2015. Chateau Petit Fombrauge makes wine blending Chardonnay, Colombard and Roussanne. What makes Franc Baudron, Petit Fombrauge and Vieux Taillefer even more unique is that their grapes are planted in the Saint Emilion appellation! All of these wines produced using grapes that are not allowed into Bordeaux are sold as simple, Vin de France wines. 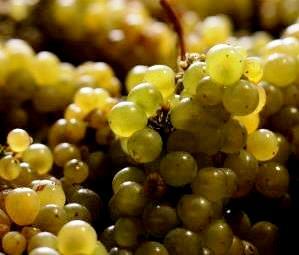 The harvest date for grapes used to produce Bordeaux Blanc is the key to the quality and style of the wine. The grapes need to be picked when they have reached maturity, which in this case is when the acidity and and sugars are in balance. This takes place days or weeks before the red wine grapes are picked. Picking white Bordeaux grapes is much harder than the red wine grapes, because the window of the correct moment to harvest is much shorter. When the berries are ripe, growers need to pick right away. Leaving the grapes on the vine too long reduces the acidity and freshness in the wine. The production of dry white Bordeaux wine. After sorting and destemming, the winemaker needs to decide if the berries should be fermented in whole clusters, (which is popular at some of the better estates today), or not. They also make a decision about allowing the juice to remain in contact with the skins or not. Dry white Bordeaux grapes are pressed quickly after picking. The juice is allowed to settle for an average of 24 hours, allowing any unwanted solid material to settle. From there, they need to chose the fermentation vessel. They can use stainless steel tanks, cement vats, large oak tanks or small, French oak barrels. The majority of the top estates vinify dry white Bordeaux wine in small, French oak barrels today. However, a few chateaux begin the fermentation process in tanks before moving the juice into the barrels where the fermentation will finish. White Bordeaux wine grapes are fermented at lower temperatures than red wines. On average, the temperatures range from 18 degrees Celsius to 20 degrees Celsius. The purpose of the lower temperatures is to slow the fermentation process, allowing more concentration and flavor to develop. Very few chateaux allow malolactic fermentation to take place. Certainly, none of the top Bordeaux estates allow their dry, white Bordeaux wine to go through malolactic fermentation. They stop it by using sulfur. The reason for this is, they want the wines to retain their fresh, crisp characteristics. After fermentation, the winemaker makes his choice for aging the wine. White Bordeaux wine is usually aged in the same French oak barrels the wine was fermented in, or in stainless steel tanks. However, all the top Bordeaux chateaux age their wine in varying percentages of new, French oak barrels. Today in Bordeaux, it is more common for producers to age the wine on its lees, which results in a richer, more complex wine. Although that seems to be open to debate as some winemakers feel aging the wine on its lees helps the wine feel softer when young, but as the wine ages, there is no difference. Some estates stir the lees, others prefer to allow it to sit. As we mentioned, the percentage of new oak barrels used to age white Bordeaux wine varies from estate to estate. Although the current trend with white Bordeaux wine starting with the 21st century has been to reduce the amount of new oak barrels used in the aging of Bordeaux Blanc. While white Bordeaux wine from the best producers like Haut Brion and Domaine de Chevalier see extended aging of their wine in new oak, (Up to 18 months) many producers bottle their white Bordeaux much wine sooner. This often takes place between 6 and 12 months after the harvest. Pairing White Bordeaux Wine with Food. White Bordeaux wine is perfect for a wide variety of dishes and cuisines. Due to its fresh, citrus profile, along with sweet fruits, spice and mineral characteristics, most seafood dishes make perfect pairings. Chicken, veal, pork, sushi, crudo and semi, spicy dishes are great matches for white Bordeaux wine. White Bordeaux wine and sushi can be a perfect pairing. White Bordeaux with raw oysters is another perfect wine and food pairing. Most soft, hard or dry cheeses will also offer great wine and food pairings when served with white Bordeaux wine. White Bordeaux wine will taste and feel far better with a slight chill. Serving your Bordeaux Blanc wine at 55 to 60 degrees Fahrenheit, 15 degrees Celsius, really adds a lot to the tasting experience. Various production figures for dry white Bordeaux wine production. 9 appellations allow the production of dry white Bordeaux wine. The most prestigious dry white Bordeaux wine, as we mentioned earlier comes from Pessac Leognan. While red Bordeaux wine is what the Bordeaux region is known for, it’s also famous for the incredibly luscious, and often decadent sweet white Bordeaux wines that come from Sauternes and Barsac. While dry white Bordeaux is produced in Sauternes, it is not what the region is noted for. Dry wines from Sauternes are sold as generic Bordeaux wine, because they do not have the necessary amount of sugar to be labeled as Sauternes. That level of sweetness is what gives fame to Sauternes. In the vineyards of Sauternes, Semillon is the king, due to what takes place when the fruit is attacked by botrytis, also known as noble rot. For the production of sweet Bordeaux wine, while some estates use 100% Semillon, the more common practice is to blend Semillon with some percentage of Sauvignon Blanc and for some estates, small amounts of Muscadelle. However, there are a few estates making wine from 100% Semillon, most notably Chateau Climens in Barsac. 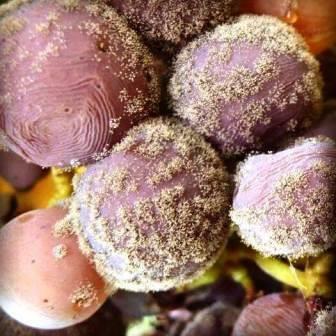 Semillon, due to its shape and lack of compactness in the bunches, is more susceptible to Botrytis. Sauvignon Blanc adds much of the acidity required in the wine. What makes these wines so special is what happens when the grapes are attacked by noble rot, also known as botrytis. You can see what that looks like in the image above this paragraph. For botrytis to develop, the vineyards and grapes require a unique combination of elements and circumstances that must take place. The microclimate of Sauternes plays a major part in making that happen. Mornings must be damp, coupled with warmth later in the day. This leaves the fruit without much moisture. What happens next is, the grapes become shriveled, dehydrated and concentrated with new, more complex, spicy, nut and honeyed characteristics. These new qualities are sought after in Sauternes and other wine regions outside Bordeaux for their sweet, honey filled, tropical and exotic sensations. The taste of sweet, white Bordeaux wine when young is dominated by ripe and over ripe tropical fruits, pineapple, peach, nectarine, apricot, lemon and oranges drenched in honey. Accompanying those initial fruit sensations you find grilled nuts, vanilla, spice and scents of fresh cut flowers. At their best, Sauternes and Barsac wines are rich, sensuous, sweet and braced by acidity that allow the wines to feel fresh, sweet and intense. The texture of sweet, Bordeaux wine is plush, round and opulent. At their best, they are rich, deep, full bodied, intense and complex. Out of all the wines of Bordeaux, Sauternes enjoys the widest drinking window. The wines are delicious when young. As they age, sweet Bordeaux wine becomes darker in hue, turning from golden yellow to orange, copper and caramel in color. In their youth, the wines are more focused on ripe yellow fruits slathered in honey. With time in the bottle, the wines shed their initial tropical fruit flavors and begin to show more flavors and scents of caramel, butterscotch, honey, spice and nut characteristics. In the best vintages of Chateau d’Yquem, which is unanimously recognized by wine lovers all the world as the best wine from Sauternes, with time, notes of chocolate covered oranges, cocoa and creme brulee emerge. Depending on the chateaux and the vintage, Sauternes can age for decades. In the case of Chateau dYquem, the top vintages can age for more than 100 years! Sauvignon Blanc, Semillon and Muscadelle are the grapes used in the production of sweet, Bordeaux wine. Chateau d’Yquem is the most famous and most expensive sweet white Bordeaux wine, there are numerous other estates making some of the best wines in their history today. Chateau Climens, Chateau Coutet, Chateau Guiraud, Chateau de Fargues and Chateau Raymond Lafon are just of the estates making sweet, white Bordeaux wine that merit your attention. Sauternes is the most expensive and labor intensive wine in all of Bordeaux to produce. Most of the labor takes place in the vineyards. Because the grapes used to produce sweet, white Bordeaux wine must be affected by botrytis, the vineyards can take weeks to pick. The reason for that is, the pickers sometimes need to pick the berries one at a time. In difficult years, the harvesters could have to make several passes through the vineyard looking for grapes with ample amounts of rot. The yields are also incredibly low. Between 8 hectoliters per hectare and 15 hectoliters per hectare is normal. The grapes at the top estates pressed in whole bunches using a vertical press. The wines are fermented and vinified in French oak barrels. However, some estates use tanks. The percentage of new oak barrels and the amount of time the wine is aged in barrel varies from chateaux to chateaux. 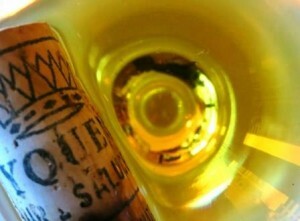 Chateau d’Yquem uses 100% new oak, while many of the other great producers use closer to 50% new oak. Sauternes and Barsac are the most prestigious appellations for the production sweet white Bordeaux wine, but there are other appellations that produce much more affordable, albeit simpler wines that can be quite tasty and sell for very fair prices. In total, 13 additional appellations also allow the production of sweet Bordeaux wine: Bordeaux, Bordeaux Superieur, Cadillac, Cerons, Cotes de Bergerac, Graves Superieurs, Haut-Benauge, Loupiac, Monbazillac, Premieres Cotes de Bordeaux, Sainte Croix du Mont, Sainte Foy and Saint Macaire are all appellations that allow the production of sweet Bordeaux wine. Sauternes and Barsac combined produce close to 480,000 cases of sweet Bordeaux wine in most vintages. The other 13 appellation together produce close to 500,000 cases of wine per year. Pairing Sweet White Bordeaux Wine with Food Making wine and food pairings with Sweet white Bordeaux wine is easy. Sauternes can be enjoyed on its own, as an aperitif or dessert or with several main courses. Some of the classic wine and food matches for Sauternes start with foie gras. Spicy Asian cuisine, lobster, crab and chicken dishes are perfect partners with sweet, white Bordeaux wine at the dinner table. One of the best pairings I recall tasting was Sauternes with oysters. The thick textures along with the briny quality of the oysters really came alive in that pairing. Cheese and Sauternes are for me, a match made in heaven. However, at least to me, sweet white Bordeaux wine and equally sweet, or even sweeter desserts do not work well together. It is overkill for my palate, due to all that sweetness taking pace the same time.